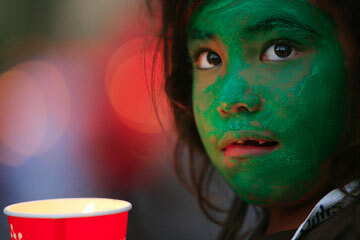 With her face painted, Shai Hose, 6, paused while watching her candle yesterday afternoon during a vigil at the state Capitol in support of the homeless, as part of Homeless Awareness Week 2006 put on by Partners in Care. Holy Trinity School students Ali Calhoun, 12, left, Ryan Lloyd, 13, Amber Manini, 13, and Malia Meza, 13, let out a cheer yesterday as their marble successfully negotiated the coaster course they made for the Junior Engineering Expo '06. The expo was held at Holmes Hall on the University of Hawaii-Manoa campus. About 450 students from grades 6 to 8 participated in the event, including all the neighbor islands except Molokai.